For weeks I’ve been telling myself I should have finished this post by now. I think I’m still trying to decide how I feel about having gone to Burning Man. Maybe I should just list a bunch of random thoughts. I suspect you can only really know what it’s like by going. I’m glad I went. I met totally awesome people at my camp. I had several deep and meaningful conversations with new friends; that is one of the things I look forward to in this community. Like when you go hiking in a beautiful place, almost no one was grumpy. There was a couple fighting outside my tent one night (“Listen to me! Listen to me!” Then silence … he was listening, so then why didn’t she talk? LOL), but that was the only negativity I can remember personally. Having some sort of purpose there is important. I helped out with an art project and also our camp setup/takedown. 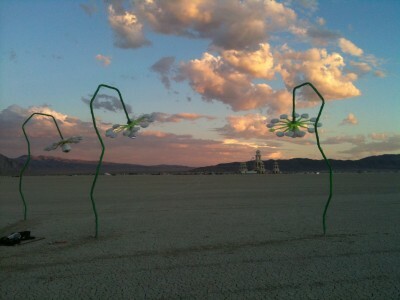 I didn’t see all the art on the playa. I didn’t go down all the streets. I didn’t see all my friends who were there. You can probably replace “didn’t” with “couldn’t” and these statements don’t lose any accuracy. In spite of being about radical self-expression, I found myself feeling a little withdrawn. I missed my electronic connections. When the rest of the 50,000 or so people got to the playa I realized I might as well put my phone away, plus I thought it might be good for me to just give it up for a week and so I did. I think I would have been alright if I’d thought up something to replace it with. But I didn’t, and so in some sense I withdrew a little. Adding to that, I found the weather/climate very uncomfortable, especially in the day: hot, dry and very dusty – and this was a “good” year. In a way the whole thing was like a big party; I enjoy but am not a big partier. I was there early and left late. 11 days of uncomfortable partying is too long for me for. I did really enjoy going out at night wearing all sorts of light-up stuff and seeing other people’s illuminated creativity and seeking out good music. Disorient, Space Cowboys, Bass Couch and the Robot Heart… The last time I found the Robot Heart it was on the move, and I was one of dozens of people on bikes, pedaling along on the port side. It reminded me of how dolphins follow a boat. So then I wondered if the sound which boats make as they motor by is like the house/psytrance music from the Robot Heart. I’ll choose to believe that. As I’ve wondered whether I can wash suede, sussed out how to clean my suitcases, and was rearranging the dust in and around my pickup the other day, I mused about why people burn so much there. And was reminded of what a trailwork friend from California said after he’d been working around poison oak – that he would wash his clothes in the fireplace. Being in some kind of funk after the burn is common. I felt a little like I’d been in a plane that someone else had been driving and they’d suddenly left and left me at the controls. Several people I know came down with physical illnesses. Socially it sounds like we’re walking on shifting sands. Now I’ve mostly got control of the plane again, but it still has a few dips and swoops. But maybe it’s better that way; don’t want to get too comfortable.